Today's useless bit of trivial information: Today, January 27, is Donna Reed's birthday. She would have been 87. She was made famous by in her rolls in movies like It's a Wonderful Life (one of my favorites) and her academy award winning performance in From Here to Eternity. 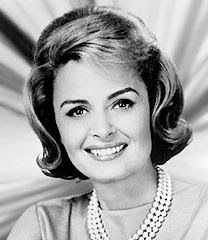 Her persona was idealized in The Donna Reed Show. (I was more of a Leave It to Beaver and Family Affair girl, myself) She died in 1986 of cancer. Why? Why!? Just why do I know this utterly useless bit of information, (or the tasty tidbit about Napoleon) you may ask. I must admit, it is my Sunday morning indulgence. A hot cup of coffee, crawl back in bed and . . . . turn on CBS. I must confess, I watch the CBS show Sunday Morning to start my week. Unlike any regular news show, there is little talk of the spiraling stock market, the increasing insurgency in Iraq and the pontificating of political pundits. This news show is filled with good news and uplifting stories. Why not start my week with a bit of light trivia or thoughtful commentary? And so, I will fill up my coffee cup, crawl back in bed, and see what commentator Ben Stein has to say this morning. Today, I was walking around Hobby Lobby with Rachel when she turned to me in all seriousness and said, "Did you know that Napoleon was the first to use 'bees' when decorating?" I am not quite sure what I should do with this little piece of trivia or why it was given to me. Anyone know how this could be useful to my life beyond winning me a game of Trivial Pursuit? Has our resolution of , drink less wine, left Rachel with entirely too much time on her hands? Or do I need more wine in order to understand these little crumbs she gives to me? Either way I think more wine is definitely going to help. Anyone else out there have any thoughts on this? Please your help is needed. Inspired by other blogs we read, we have decided to make a joint list of our resolutions for 2008. We are aiming high with 30 resolutions . We feel confident we can achieve them all if we work together. 1. To wear our cute clothes on a daily basis instead of saving them for special occasions. 2. To light candles nightly in our homes. 3. To greet our husbands in 1950's style, with a smile on our faces and a clean welcoming home. 5. To not complain about doing laundry and how it never ends. 6. To not complain about our children putting clean clothes into the hamper because they don't want to fold them. 7. To wash our cars more than once a year. 8. To find out and share better gossip on our friends and enemies. 9. To drink less wine. 10. To stop wasting hours looking at the internet and forwarding links to each other. 11. To eat more meals consisting solely of appetizers. 12. To find more amusing cards to send to each other. 13. To actually sew instead of just staring in awe over our fabrics. 14. To water our plants regularly not just when they turn brown. 15. To shop sales more diligently. 16. To take more pictures of our children, and less of our craft supplies. 17. 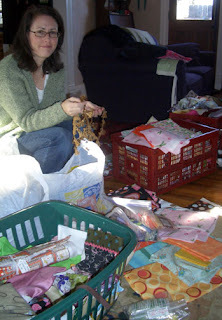 To use the fabulous craft supplies we have and not save them for a "special project"
18. To make every project special. 19. 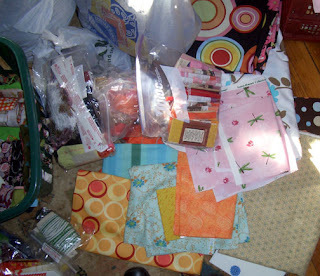 To not learn another craft until we finish all the projects we have bought supplies for and never started. 20. To throw more parties. 21. To drink more fine wine. 22. To be brave enough to cut the pretty fabric and papers and not just look at them. 23. To make fabulous tote bags for every occasion. 24. To use the fabulous tote bags on a regular basis. 25. To make fantastic bags and accessories for our children so they too can have an artful life. 27. To read more blogs and to comment with witty feedback. 28. To write more witty, crafty blog entries. 29. To have more art give-aways. 30. To host an art swap with all our artsy friends and throw a party to celebrate! I am happy to report that the cold snap is finally at it's end here in Lafayette, Colorado. When I took the girls to school this morning it was 22 degrees , we all thought it felt great outside. That should tell you something, if 22 felt warm, it must have been really cold for a while! Look at Friday! It's a heat wave! 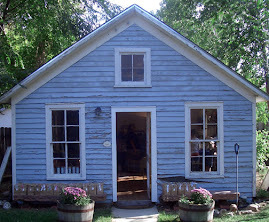 To celebrate the "great" weather, and to get back to business, Kerry and I plan to be open for coffee hour this Friday! Yay! We are so excited! What, you may ask, is coffee hour? The studio is open for coffee on most Friday mornings from 9:00 - 11:00 am. Join us for coffee and a sweet treat. You can peruse, shop, visit, sometimes make your own project, and check out our latest endeavours. If you are in the neighborhood, we'd love to see you. Why don't you stop by? Today Kerry and I swapped fabric. We each have sewing machines at our own homes. We don't keep sewing machines in the studio, I don't think there would be any room. So, we divide the fabric we own together and periodically trade. It is quite a sight! We each have our fabric in big crates. One of us hauls our crate to the other person's house. Today, Kerry brought her fabric over to my house. 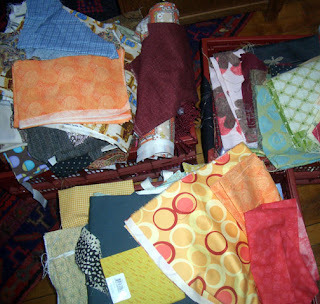 Then, in the living room, we had a fabric explosion! After all, you can't trade fabric without knowing what you have to share. We spent a fair amount of time sorting and combining fabrics and discussing what we could make out of the respective pieces and combinations. Then, we claim the pieces we want to work with and re-pack our boxes. Today we even created challenges for each other. Actually Kerry gave us both a challenge. To assemble all the items which are already cut out. I don't know about you, but I have a number of items cut and not put together. Nothing huge, just a few pouches, tissue holders, and tote bags, well, quite a few. So, we will see if I can rise to the occasion and finish all the work I have started. Stay tuned for updates, and give me some encouragement to get it all done! 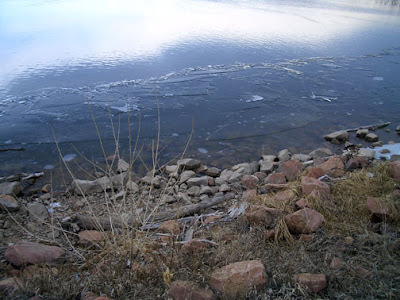 From our walk last week, ice pieces at the edge of Waneka Lake. 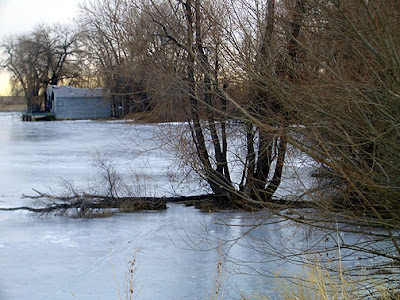 On the other side of the lake, trees in the ice. It was a balmy 52 on Tuesday. We were both excited to get back to work and back to walking. Our excitement didn't last long, however. Wednesday it was 17! What a difference a day makes! Now it looks like we are stuck in the cold. The forecast, except for a brief warm up tomorrow, looks dismal. This is a big bummer for us, because the studio turns into an icebox when the temperature stays a 32 or lower. So, our creative studio time is on hold for the time being. We are forced to focus on other projects. Laundry, cooking and cleaning....not exactly creative. Maybe we will get out the sewing machines and stitch up some surprises. For now, studio hours are on hold. But we have lots of plans for the Spring thaw, expanded studio hours, a garden party, maybe an art swap, who knows what we'll think of next! Side note: When I looked up Piero Milani I found one reference that says he's an artist. I found lots of quotations by Piero Milani, but no art. Does anyone know who he is? Just curious. This morning, my husband Mike went into the garage to get the dog food. He was unusually silent and I poked my head in to see what was going on. Mike beckoned me over and we stood looking at the garage shelves where something alive was obviously moving around inside a plastic bag! It was doing quite a lot of moving in a very cartoon like fashion. Being the highly intelligent people that we are, we deduced it was a mouse. Later that morning, I was getting in the car to take the kids to school and saw the super mouse jump down to a lower shelf! Yes, I added poison mouse to my to-do-list today. Killing is not a common agenda for my day but neither is having to battle living creatures to get to my stuff. 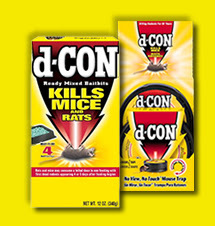 For mice (sadly this is not our first, visitor) we opt for D-con poison. You put the little box out, away from the kids and dog and soon thereafter the box has moved a few inches so that you know it has been accessed. Then the mice mysteriously disappear. I know people say that they go in the walls and smell, but we have never had that happen. They simply run away to look for water and we clean up the torn bits of paper and droppings that are the only evidence of our former roommates. Why don't I use traps? A disturbing incident as a child has kept me away from them, (and no human limbs were not involved.) We had an infestation of mice in my childhood home. We caught many in traps, until the day Gordo the Great came to live with us. There was a trap in the room next to mine. One night it went off and woke me up. I was terrified. Even more so, when I heard something in the hallway and then something banging against the side of the bathtub making an erie SOS signal. I finally called my mom. She told me to go back to bed and that I was exaggerating (ME!???) The next morning, the trap was sprung but no Gordo. That was when mom finally believed me and we knew we had more than an average mouse. Several more traps were sprung and no Gordo. Then he did the worst thing possible! He destroyed the popcorn container I made for my parents at Girl Scouts, eating the shellacked corn and worst of all stealing the mini-salt shaker I had glued to the top. How could he? Mom invested in larger rat traps (and no, we did not live in the ghetto but in the lovely foothills of Burbank, California.) Gordo avoided the rat traps. He knew better. Finally we resorted to poison, never to hear from Gordo again. And that is why I am a poison girl. Goodbye Gordo. We had guests at our house from January 2 - 9. My dad, step-mom and Grandmother came to spend a week with us and see the girls. We had a great time, ate too much as you do when there are guests in town, but we all had a good time. Having company is a good excuse to play tourist in your own town. I had heard a bit about the Leanin' Tree Museum of Western Art, but had never been for a visit. I guess I pegged it for a Cowboy Museum, or perhaps a lure to get people to the Leanin' Tree Card Company Store. It was nothing of the sort. It is a shame that I hadn't been before now. It is a fabulous place to visit. They had a wonderful collection of Western Art. It certainly is a niche museum, focusing on Cowboy paintings, Western landscapes and Russell - style bronzes. But, one of my favorite displays was a series of Fritz Scholder paintings depicting Native Americans (sample above). In addition to the two levels of galleries, the museum has a wonderful outdoor sculpture garden. We enjoyed the larger-than-life sculptures of wildlife and western icons. While a museum filled with Cowboys may not appeal to everyone, I felt the quality of the art and the diversity represented within the niche was appealing and interesting to most. Our little group, ranging from age 6 - 90 enjoyed our time there. The whole story will begin to show. We are coming out of our winter hibernation. The studio is chilly (read - frigid) in the winter. Our little electric heaters don't help much when it's below the freezing mark. As the weather turns, and the flower buds begin to show, we will also emerge. note: We haven't quite had this much snow this year. 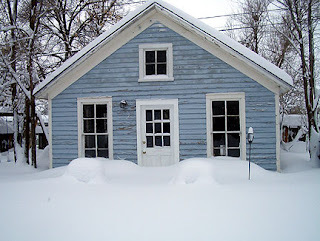 The above photo is from the first of the 2006-2007 blizzard season. We are hoping that the weather this year will continue to be somewhat mild. Happy New Year & Good Tidings to all!